When it comes to bathroom lighting, you likely have your preferences for what you like and what you don’t like. You use your bathroom on a daily basis, which is why it’s imperative to have the proper fixtures in place. At Hacienda Lighting in Scottsdale, we’re dedicated to helping every customer find the perfect bathroom lights, and this page is intended to provide some helpful tips for anyone who wants to update their bathroom fixtures, who’s building a new house, or who simply wants to look at their lighting in a different way. If you’re starting on the journey of building a new bathroom, either in a new home build or your existing property, then there are some questions that need to be asked regarding the new lighting design. One of the biggest challenges that many homeowners encounter when looking for new bathroom lights is that they don’t know where to start. 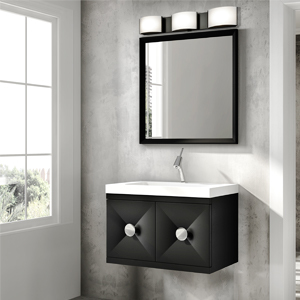 Do you begin with the vanity and sink area, or do you look at lights for the bathtub and shower? The simple answer is that it doesn’t really matter. If you’re in our showroom and you see a light that will look great above your new sink, then add it to your list. If you’ve already picked out the soaker tub that will go in your bathroom, then you might feel encouraged to find the light fixture that matches it perfectly. You shouldn’t have to worry about where to start when it comes to your new bathroom lights. All you have to do is be ready to look for fixtures that speak to you and that fit your vision of what your new bathroom will look like. Our expert staff is here to help you every step of the way, and they can answer any questions you have. 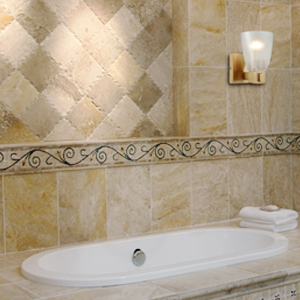 The ambient lighting in your bathroom will likely come from the central fixture of the room. This can be a mini chandelier, a semi-flush mount fixture, or another light that can illuminate the majority of the room. Whereas you don’t necessarily want the light with the globe shade that you had in your house growing up, you do want a fixture that will provide general light for the room. There are many options that can achieve this goal, and you can go for that spa-like look that makes the bathroom more inviting and install an elaborate fixture, or you can choose function over form and install a standard light. The choice is up to you! You use your bathroom daily, and a majority of that time is likely spent in front of the mirror. Whether you’re shaving or putting on makeup, it’s essential that you have enough light around the sink area. Now, the first thought is often to put up regular vanity lights above the mirror and have them shine down on the countertop. While this configuration can be found in many homes, it’s not always the most ideal for this part of the bathroom. Light that comes from above can cast shadows and lines across your face, which isn’t the best when it comes to shaving or putting on mascara and lipstick. 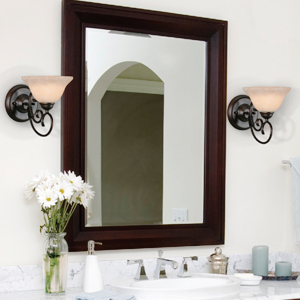 Wall sconces are a great choice for your vanity and placing them on either side of the mirror will allow them to cast light in the proper direction. That way, you can see your face clearly as you get ready for the day or prepare to head to bed after a long day. As for accent lighting, this can come in the form of recessed lighting on the ceiling, as well as in any alcoves or other architectural features of the bathroom. Recessed fixtures are a great choice for the bath and shower areas, as you don’t want any lights hanging down and encroaching on these spaces. You can also add LED lighting to any high shelves or nooks where uplighting will make the room seem bigger than it is. Once you’ve picked out your new bathroom light fixtures and the design is mostly in place, you’ll want to select the right lighting controls for each light. A single switch won’t cut it, and you’ll likely want separate controls for the vanity fixtures, the recessed lighting, and the central ambient fixtures. Dimmers are a great choice for the bathroom because they let you set the levels for when you’re showering in the morning or when you’re taking a hot bubble bath in the evening. If you’re building a new bathroom and you’re having trouble deciding on lighting, then please contact or visit us as soon as possible. Our local showroom is filled with an amazing selection, and our experienced staff will make sure that you come away with the best options that fit both your vision and your budget. When it comes to updating an old bathroom, one of your first priorities is likely new light fixtures. The current lights are simply too outdated, and they can make your bathroom feel older than you want it to. Finding a new lighting style can be a great way to update the room, and adding more light can transform the space from dull and uninteresting to inviting and luxurious. If you bought your home from someone, then there were likely some “personal” touches that you changed not long after you moved into the house. Things like the paint color in the living room, the wallpaper in the dining room, and the carpet in the bedroom simply had to go. When it comes to the bathroom, the first thing you noticed may have been the light fixtures that looked like they were straight out of the 1970s (and they very well may have been). Finding a new lighting style for your bathroom can be the best way to breathe new life into the space. Perhaps the current fixtures have too much gold on them, and you’re more of a silver or copper person. Maybe you don’t want any metal embellishments at all, and you’d rather have Rustic-style fixtures that reflect your personal tastes. Taking out the old fixtures and installing new ones can make the bathroom feel like new, even if you don’t change another thing in the space. Once you add the toilet, the vanity, and the shower or tub that you want, the room will look and feel exactly how you want. Another drawback that homeowners can run into when they buy a home is that the bathrooms don’t have enough light. Either the ceiling fixture is outdated and doesn’t provide enough illumination, or there’s only a vanity fixture and nothing else in the room. Builders of the past often prioritized function over form, and lighting design only included making sure there was at least one fixture in each room. When it comes to your bathroom, a great way to update it is to add more light in the form of recessed fixtures, wall sconces, and more. Function is still important, but you want the space to be spa-like and extravagant, not simply utilitarian. Two areas you can focus on when adding more light are the water closet and the shower/tub surround. If the toilet is positioned in a corner of the bathroom, then consider adding a recessed light above it. If the shower area is too dark when you close the door or draw the curtain, then putting a recessed light near it will make the space brighter and more comfortable. As we noted above, you’ll want to be sure that you have the right lighting controls for any new fixture that you install. When installing your new bathroom lighting, it’s important to keep in mind that new wiring may be necessary in order to operate all of your new fixtures. This is often best left to a professional who knows how to safely install new wires and attach all of your new fixtures. You’ll also want to keep in mind that you won’t be able to use your bathroom while the lighting is being installed, which is fine if you’re in the middle of a full remodel. New wiring and lights can be added fairly quickly, especially if you have an experienced electrician who knows what they’re doing. Before long, your new lights will be in place and you’ll be able to use your bathroom like never before! While the priority for new lighting is likely your master bathroom, that doesn’t mean that the other bathrooms in your home will remain untouched. Focusing on each bathroom in turn can help make your home more comfortable, and friends and guests will feel more at ease whenever they come to visit. The powder room is often located off the front hallway of your home so that guests who come for a few hours have a bathroom they can use. They won’t have to find their way upstairs or into the bedroom to find a bathroom, and they can freshen up as they come in or before they leave your home. This bathroom often consists of a toilet and a vanity, and the lighting for your powder room can be simple, yet elegant. Wall-mounted fixtures near the mirror will help guests as they touch up their makeup or look at their face, and a small central ceiling fixture will provide the necessary ambient lighting. You can probably get away with just two light switches in this room — one for the main fixture and one for the vanity lighting. It can also be good to have a ventilation fan in this room, and you can add that to the same switch as one of the other fixtures, or place it on its own. If you have family or friends who come to stay with you on a regular basis, then it’s important to have a well-lit guest bathroom. This bathroom is smaller than the master ensuite, but it still contains a toilet, a vanity, and a shower or bathtub. Lighting for each area will be important, and adding a small chandelier as the ambient fixture can make your guests feel like they’re getting the luxury treatment. If you rent the room out on Airbnb or a similar service, then having the right lighting can even improve the reviews that you get! Your guest bathroom lighting doesn’t have to be elaborate, but it should be effective at helping guests enjoy their time in your home. The right vanity lighting, central fixture, recessed lights, and controls will add to a cohesive design that creates a positive impression and makes guests feel welcome. When you looked at your home before you bought it, one of the first rooms you may have evaluated was the master bathroom. It may not have had everything you wanted, but you saw the potential that the space had. You knew that you could transform it with new bath fixtures and new lighting, and if you’re starting on that endeavor, then we hope that this page will prove to be more than helpful. You’re going to use your master bathroom every single day, whether you’re getting ready for work or unwinding before bed. You might take a shower each morning and a bath most evenings, and you definitely use the sink to shave, put on makeup, and check your complexion. With the right lighting in the right places, you’ll be able to move comfortably from the toilet to the sink to the shower, turning lights on and off as needed. There will be no spots that are too bright or too harshly lit, and you’ll be able to control your lighting to set the desired mood. The style of fixtures that you choose will reflect your personality, and the room’s design will become an extension of your tastes. At Hacienda Lighting in Scottsdale, we can help you find the perfect bathroom lighting for your home, no matter if you’re building or updating a powder room, a guest bath, or a master ensuite. We’re proud to be a locally owned Lighting One® showroom, and our expert staff is more than ready to help you find new fixtures. You can bring your questions and your concerns, and you’ll receive exceptional service from the moment you walk through the door. We’re open Monday through Friday, and on Saturday by appointment only. Feel free to contact us by giving us a call, by visiting the showroom, or by filling out the form below.